Display is 8 digits, green vacuum-fluorescent. Integrated circuit: Rockwell A5501CC (here date coded 1976, week 46). 69 mm x 118 mm x 24 mm (2.8" x 4.7" x 1"). This is similar to the ANITA 811. It is labeled for Fi-cord Ltd. of Didsbury, Manchester, and was made in Yugoslavia. Has the three-pin adaptor socket so it can be powered from the ANITA AC Adaptor while containing disposable, non-rechargeable, batteries. 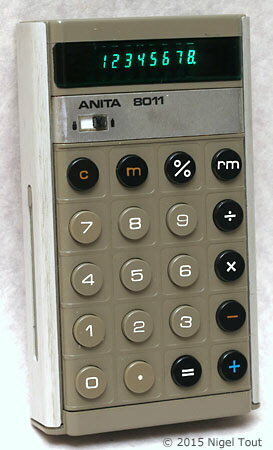 As mentioned by John Sparkes on the page The Demise of Anita & Bell Punch, around 1976 Rockwell decided to exit the calculator market and "an electronics company was founded in Niš, Yugoslavia, which was interested in buying both the design and the production facilities of our hand-held calculators". Fi-cord was a marketing company for consumer electronics and had already been a distributor of ANITA hand-held calculators. Its involvement with the operation in Yugoslavia is not known but it had some of the ANITA models made there labeled with its name. The rear aluminium cover slides up to allow the batteries to be replaced. In doing so it reveals the label which shows the details of this model. 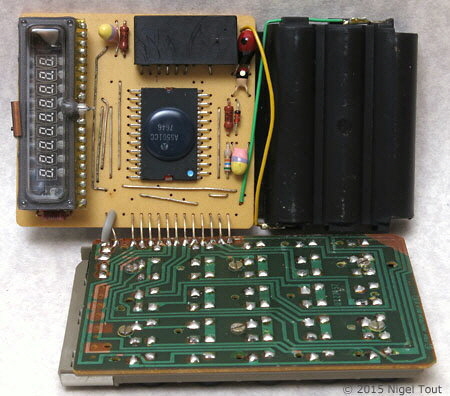 The circuit boards showing the Rockwell A5501CC integrated circuit, (here date coded 1976, week 46).